Routes into Languages is a fantastic organisation, based at Manchester Metropolitan University, that works to promote foreign language learning for primary and secondary pupils. Routes contacted us because they were launching a brand new primary language scheme called “Language League Kick Off”. The scheme, available in French, German, Spanish and Arabic is delivered in a 90 minute session of two halves – sound familiar? Pupils study a language for one half and play football for the other half. Not only that, but the vocabulary in the language scheme is structured around football, so pupils learn parts of the body, colours etc in a footballing context. It’s a fabulous way to engage those pupils who may not immediately see the relevance of language learning and it has proved incredibly popular in primary schools across the country. 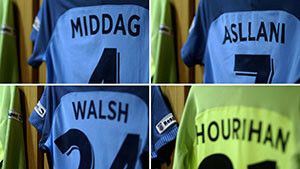 To Launch Language League Kick Off, we had the exciting opportunity to interview four footballers at Manchester City Women’s Football Club. 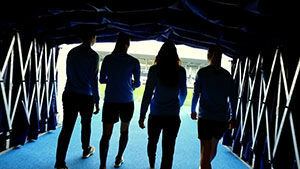 Our brief was to produce a fun, dynamic manchester city women team video, aimed at primary pupils and teachers, focusing on the relevance of languages to football and giving a positive message about how fun language learning can be. It was amazing to gain access to the MCFC Academy, a stone’s throw from the Etihad Stadium. 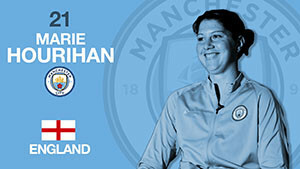 We interviewed Kosovare Asllani, Tessel Middag, Keira Walsh and Marie Hourihan and found out that their language skills had been crucial to their careers, especially for Kosa, who hails from Sweden but has played for Paris Saint-Germain as well as MCFWC. The players shared their experiences of language-learning and Tessel and Kosa even taught us a few words in Dutch and Swedish, as well as introducing us to the delights of Stroopwaffels! Mmm, lekker! This was a project with three major corporate stake-holders and it was vital for us to ensure we set the right tone, following the branding guidelines and respecting the needs of all parties concerned. 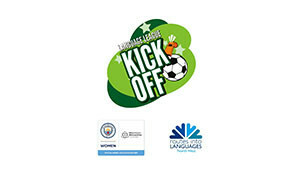 We have received excellent feedback from Manchester City Football Club, Manchester Metropolitan University and Routes into Languages and we hope this promo will attract many schools to participate in Language League Kick Off!